The limousine company operator that owned the vehicle in which 20 people were killed in a horrific crash last Saturday in upstate New York has been charged with criminally negligent homicide, said court officials on Wednesday. Authorities charged Nauman Hussain, who is 28, with one felony count following the deadliest transportation accident in the U.S. in nearly 10 years. Hussain was released from jail after posting $150,000 bail in Cobbelskill, which is near Albany, the state capital. The judged entered a plea of not guilty on Hussain’s behalf. Hussain’s arraignment took place miles from the Schoharie crash site where people were holding a candlelight vigil for the 20 victims. 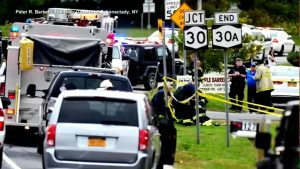 Governor Andrew Cuomo said Monday that the 2001 limousine involved in the fatal crash was a Ford Excursion and had failed inspection in September and that the driver that night did not hold the proper license to drive the vehicle. State officials had ordered that the vehicle be taken out of service during September and it should not have been driven that night or any night said the Superintendent for the New York State Police. The Superintendent added that the sole responsibility for that vehicle being driven on Saturday rests with Mr. Hussain. Nauman’s father Shahed Hussain is the owner of company that owns the limousine Prestige Limousine, but he is not in the U.S. and additional charges could be forthcoming, said authorities. The lawyer representing the company Lee Kindlon told a Wednesday news conference that he would defend Mr. Hussain against all charges. On Tuesday, Kindlon said that the safety violations that were issued in September on the Ford Excursion limousine were for the most part minor and were not causes for the crash. The vehicle, which was carrying 17 and the driver headed to a birthday party Saturday, but ran a stop sign at the intersection of a highway in Schoharie. It then crashed into a parked car that was unoccupied and two pedestrians prior to stopping in a shallow ravine, said officials. The driver, the 17 passengers and both pedestrians were killed. Prior to the vehicle crashing, Erin McGowan one of the passengers in the Ford Excursion, texted someone that the limo appeared to be having engine problems said a report in the New York Times.